These words above are the opening lines of the work of Sir Geoffrey de La Tour-Landry, a country nobleman who lived in the 14th century in Anjou. Having fought many a battle during the Hundred Years War, Sir Geoffrey was a man of arms, but he was also a family man. 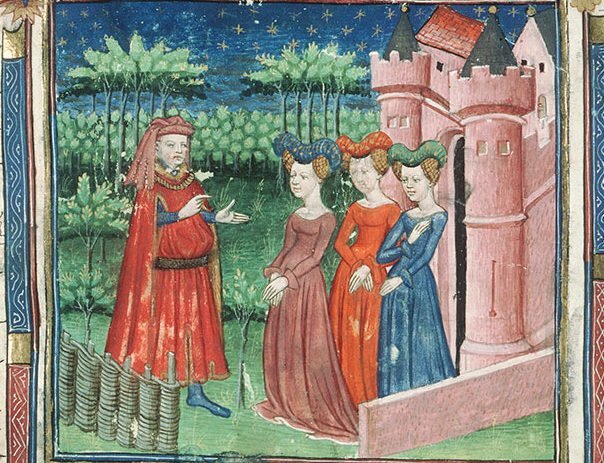 On a particularly fine, April day, in the year of our Lord 1371, Sir Geoffrey had the leisure of sitting in a shady garden, ‘mourning and pensive’ over his deceased wife yet somewhat comforted by the birdsongs and the vernal scene around him, he saw yonder coming Jeanne, Anne, and Marie, his three young daughters. The sight of the carefree girls suddenly brought Sir Geoffrey back to the bygone days. He membered the good old days when he was a young soldier, and how the soldiers who rode with him used to boast about their conquests – not of lands and wealth but of ladies and maidens. Reflecting how those shameless young men deceived the ladies and how the ladies lost their honour undeservedly, Sir Geoffrey became painfully aware that similar things might also happen to his girls, once they entered the society. To brace them against potential temptations, Sir Geoffrey decided to pen down a few words of wisdom for the lovely Jeanne, Anne, and Marie. The result, of course, is what is now known as The Book of the Knight of the Tower, an instructive book on manners for young ladies. The book was hugely popular not only in Sir Geoffrey’s time but also in the centuries to come. Although many of Sir Geoffrey’s views – such as that a wife must patiently bear her husband’s harshness and be absolutely obedient – and suggestions will be frowned upon by modern readers, The Book of the Knight is nevertheless an interesting document, as it not only gives us insights into the attitudes and social expectations for women in the 14th century, but also brings us face-to-face with a medieval parent, so that we learn something about his family and hear his concerns for his children. Below are some advices the father offers his young daughters, interlaced with illustrative anecdotes. Love and honour God, and always say your prayers. The first and foremost concern of every good Christian is no doubt the safety of their soul. Naturally, The Book of the Knight starts with a reminder that the heavenly kingdom is what we must all strive for, and one must always turn their hearts and thoughts to God. The girls must never forget to say their matins, hours, and prayers to thank and praise God. Before going to bed, they ought to pray to the Virgin Mary and all the holy saints. But what happens when one forgets to pray or acts disrespectfully towards the pious? Sir Geoffrey warns his daughters with an example set by two Byzantine princesses, one sinful and one devote. Young and inexperienced, the princesses fell in love with two knights, who were brothers, and agreed to grant them their bodies on a certain night. When the lover approached the pious princess, he had a vision of her being surrounded by over a thousand of men in shrouds; he left in fear and fell sick afterwards. The second lover, however, got access to the sinful princess without trouble and got her pregnant. Furious, the Emperor drowned the princess and flayed the lover alive. When the pious princess learned the lover’s vision, she thanked God for preventing her from erring and kept her chastity ever since. In the end, the pious princess married a great king and became a lady of great renown. However crucial it is, to behave as a good Christian is not enough for the girls, for they also have social expectations to fulfil. As aristocratic women who are at or approaching marriageable age, they must be told how to comport themselves graciously and courteously to show their potential of coming great patrons and, therefore, to attract good husbands. One wrong thing to do would be to ‘turn their heads thoughtlessly here and there’ like a tortoise or a crane, but ‘hold yourselves steadfast like the hare, a beast that always looks in front of him without turning his head all about’. To strengthen his points, Sir Geoffrey gives two examples, one faraway and the other near. The first one concerns the three daughters of the King of Denmark. The eldest, prettiest girl of the trio lost a good marriage because she kept looked around her, ‘shifting her gaze like a weathervane’; the second sister spoke too much and too fast, without first giving thought to what she had heard; the third princess, though not as pretty as her sisters, won a worthy husband in the wise king of England because she was demure and well-behaved. The other anecdote is about Sir Geoffrey himself, how he rejected a potential bride on the ground of her frolics and lack of scruples. The girls probably would find this example more real and interesting, since it happened to their own father. Proper behaviour also entails proper appearance. A lady must dress herself elegantly and moderately and, never be the first to try out new fashions. Here Sir Geoffrey recounts an argue between a lady of Guyenne and lord of Beaumont. The lady reproached the lord for not dressing his wife in the latest fashion, that is, to have big embroidered edges on the garments and hoods, and to have slits in the skirt. The lord revealed that the fashion was in fact started by English prostitutes who followed armies, making the lady look like a fool in front of the court. The lady ended up in Hell, wearing all her gowns that the devil made burning like fire.